Professional baseball scouts love to make a distinction between “control” and “command” when evaluating pitchers. A prospect who can throw his various pitches for strikes is said to have control, while one who can locate his pitches anywhere he wants at any time is said to have that rarer commodity referred to as command. Applying this concept to the art of writing mystery novels within an ongoing series, one could say that an author has control over recurring characters and ongoing themes if they can maintain a basic consistency in how they’re deployed in each new novel. In rarer cases, they can exhibit command over their material by moving the various elements around to show readers new and exciting wrinkles each time out. 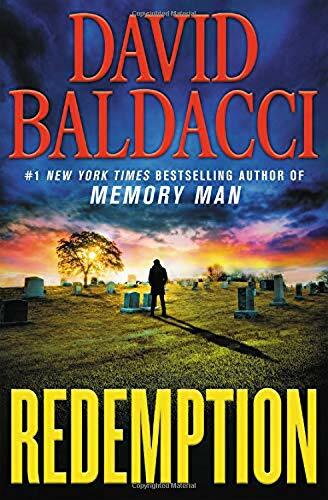 Redemption is David Baldacci’s fifth mystery featuring Amos Decker, the Memory Man. In this installment he returns once more to Burlington, Ohio, to visit the graves of his murdered family. While at the cemetery he’s unexpectedly confronted by Meryl Hawkins, a convicted killer from the very first homicide case Decker investigated as a young detective with the Burlington police. Increasingly convinced that Hawkins was innocent after all, Decker revisits his various errors and oversights until he uncovers evidence of a stunning, heretofore unsuspected criminal operation that explains the Hawkins conviction and extends far beyond Burlington’s sleepy city limits. Amos Decker returns in this novel with all the various series conventions intact. A former football player, he’s a “mountain of a man” at six five, 300 pounds, his diet is poor, his social skills are spotty at best, and the hyperthymesia and synesthesia resulting from the head injury that knocked him out of football still plague him. While this condition makes Decker an interesting series protagonist (the synesthesia component being applied only in spots and for no apparent reason), Baldacci’s other series characters need serious help. Alex Jamison is back, but she’s quickly run off to Washington so that Decker can interact with Mary Lancaster, his old partner with the Burlington police. Jamison’s relationship with Decker continues to offer possibilities, but . . .
Partway through the novel, former convicted murder Melvin Mars (The Last Mile, 2016) hits town to assist Decker in his investigation. As a sidekick, he’s like something out of a bad ’70s black-and-white-guy buddy film. His jive dips and fades, he dates and baits a primary female suspect while remaining emphatically faithful to the little woman back home, and the football stuff ends up being just a little too hokey to swallow. The worst characterization sin, however, takes place after the story has been chugging along nicely enough for the first hundred pages or so. With Jamison out of town and Lancaster alienated by Decker’s poor social skills, Decker has been poking into things on his own when Baldacci suddenly decides his hero needs a new barrier and personal threat. Enter Detective Blake Natty and Superintendent Peter Childress. This is the kind of fictional device that sends otherwise intelligent readers flying out to the woodshed in search of an ax to chop this offending 400-page outrage into tiny little pieces. Why do bestselling authors think it’s cute to unexpectedly introduce characters who suddenly and unjustly attack our beloved hero and attempt to derail his intrepid efforts at every turn? Natty and Childress are such outrageous cretins that it’s not possible they could be arresting and humiliating Decker, is it? As readers we’re supposed to feel upset and protective of our hero, but these characters are so blatantly flat and ludicrous that we end up enormously pissed that Baldacci would think we’re stupid enough to play along with this kind of nonsense. Using characters this poor to introduce a plot twist is an indicator that Baldacci is a rather weak performer when it comes to plot in general. Decker repetitively orbits around main suspects Mitzi Gardiner, Susan Richards, and Rachel Katz like a moth around a porch light, making no progress, until we have to restrain ourselves a second time from going after that ax. But when Baldacci finally pops the bubble and reveals the actual crime underpinning the whole thing, it’s so implausible it’s a little numbing. Really? It’s that? Where on earth did that come from? In Redemption David Baldacci maintains that basic consistency with his series protagonist, which makes the Memory Man so attractive to fans. Decker is an interesting character worthy of further exploration. Unfortunately, the author’s control of other elements such as secondary characters and plotting is wildly uneven. At the end of the day, he’s far from being the kind of author one could say has consistent command of his material. Redemption is more Amos Decker for faithful fans who love their guy, but it’s a long, long way from being worthy of anything more than faint praise.